Nationalism is on the rise in many parts of the world, exacerbating the free rider problem and encouraging countries to look out for themselves. Bold reforms can no longer rely on appeals to global solidarity and must speak to national self-interest. Adding border adjustments to carbon dividends plans – based on the carbon content of imports – can prevent free riding and establish new geo-economic incentives that compel other nations to follow suit. Dividends financed by border adjustments will benefit citizens of nations that have adopted such a plan, at the expense of citizens of nations who have not. Once one major country or region enacts carbon dividends, it will not only set a precedent but set in motion a domino effect that compels all major economies – for their own national interest – to do so. Economic inequality is a daunting problem, only likely to worsen given its twin drivers of technological progress and globalization. Carbon dividends offer a new way to mitigate inequality by increasing the disposable income of all citizens in a manner that disproportionately helps those who have the most trouble making ends meet. The US Treasury Department found that the bottom 70% of Americans would benefit economically under a carbon dividends plan. A fully implemented plan in America could provide a family of four with up to $5,000 a year in supplemental income. Yet these dividends would not be giveaways; rather, they would be earned based on the good behavior of decreasing one’s carbon footprint. This opens up a whole new paradigm for social policy. Although closely linked to inequality, the populist sentiment spreading on both sides of the Atlantic has deeper roots. Increasingly, voters feel that political and economic systems are rigged against their interests by the wealthy and powerful. Populism can be a dangerous force, and the best remedy is to redirect its energy in a socially beneficial direction. A carbon dividends plan offers a rare opportunity to do so by setting new ground rules that make intuitive sense: the more you pollute, the more you pay; the less you pollute, the more you come out ahead. This would tip the economic scales towards the interests of the little guy, at the expense of the wealthy who will typically pay more, which could inspire a new constituency of climate advocates. Traditional political alliances are fraying, especially in the United States, where the future direction of both parties is in contention. 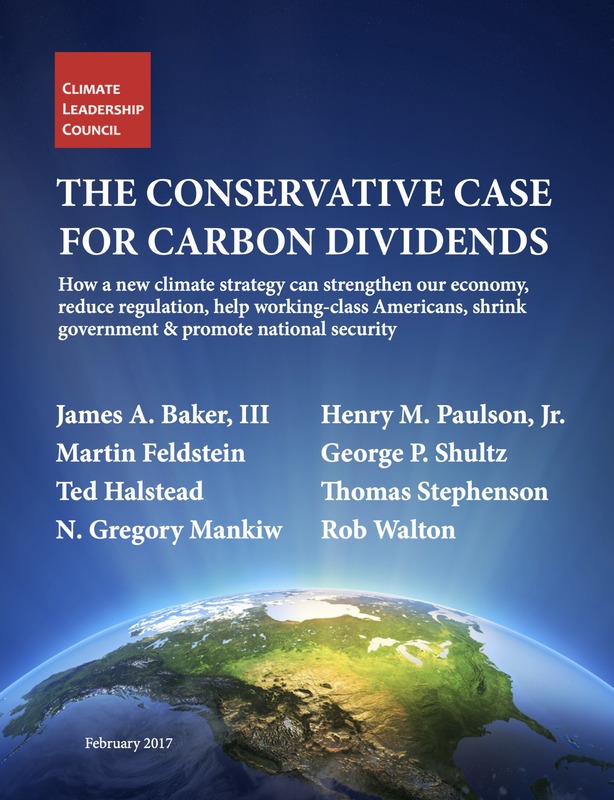 Although the Republican Party has long been hostile to emissions reductions, a carbon dividends plan offers the GOP several strategic advantages. First, dividends should appeal to the party’s base – and Trump’s voters in particular – for the reasons outlined above. For the GOP establishment, corrective fees are fully consistent with free market principles, and once firmly in place, justify the elimination of a range of existing regulations, including the Clean Power Plan. The policy’s post-partisan appeal stems from the fact that all major factions could realize an important victory. Global climate change and our dependence on fossil fuels are increasingly contributing to a less stable world. The Pentagon considers climate change a “threat multiplier” that will require more frequent military interventions to respond to natural disasters and the ensuing disorder and chaos, especially in demographically vulnerable regions. Our continued over-reliance on fossil fuels props up rogue petro-states and makes us vulnerable to a volatile world oil market. A program of carbon fees and dividends would accelerate the transition to a low-carbon global economy, and thus to a more stable and secure world. Not only would it help prevent the destabilizing consequences of climate change, it would also reduce the need to protect politically vulnerable oil-producing regions.